Here’s a fun freebie for mom this Mother’s Day! Get a FREE 5 Qt. 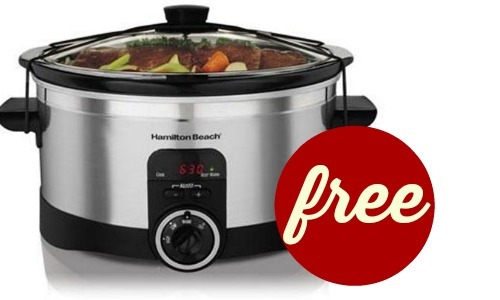 Programmable Hamilton Beach Slow Cooker right now when you sign up to be a new TopCashBack.com member! When you join Top Cash Back you will pay $24 for the 5 Qt. Hamilton Beach Slow Cooker in red plus you can get $26.50 in cash back! This makes for a fun moneymaker! 2. Scroll down the special offer page and click “Get Cashback” (it will take you to Kmart.com). 4. Within 14 days, you’ll receive your credit. You can get it credited straight to your checking account or you could be paid via PayPal or with an Amazon gift card. Note: this deal is for new members only. There is a limit of (1) per account. This deal is valid through 4/28 or while supplies last.